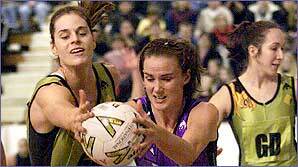 A game of netball lasts for an hour. The match is split into fifteen minute quarters with a three-minute break between the first and second and the third and fourth quarters. Half-time between the second and third quarters lasts five minutes. Teams will change ends after each quarter.